As any well-rounded guitarist knows, a capo is not only a handy tool to have but using it is also a resource needed for learning how to become a better musician. A capo is a handy tool for changing the pitch and key of a guitar. Think of it this way: If you play an "A-chord" without a capo (e.g. in the "open" position) you get an "A-sound". However, if you were to put a capo on the first fret and play an "A-chord", no longer would you have an "A-sound", now you would have a "G#-sound". Pretty cool eh? Or, is it confusing? Well, whichever it is to you, take note that I have created a capo converting program and am offering it for free here on Pisteuomen. It's very user-friendly and helpful. 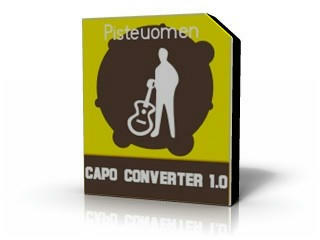 It's called the "Pisteuomen Capo Converter 1.0". You can download the program by clicking the package icon below. Enjoy!!! Oh, and if you use it, why not let me know what you think? I'll try to add this to the "free software" browsing tool soon. Michael...i'm sure this is a great tool, and i love reading your blog. However, as a guitarist, you must know that putting a cap on the first fret and playing an A certainly will not get you a G#. Bb maybe, but never a G#!!! Dude, you're so right. I think I was thinking in reverse when I wrote the post (eg. I went a half-step down instead of up). For sure, it is a G#! That's how it is in the program I created!!! Anyway, I appreciate you pointing this out, I'm off to fix it right now.